Bryan Everitt was born in rural Ontario in 1872, then moved to Detroit in the 1890s to work as a carriage maker. By the late 1890s, he had his own successful shop. When the R. E. Olds’ plant on Detroit's east side burned in 1902, Olds turned to Everitt for the bodies he needed. This business boomed, so Everitt recruited Fred and Charles Fisher from their carriage business in Norwalk, Ohio to build the curbed dash bodies that Olds used in his popular model. The Fisher brothers from Ohio also had an uncle in the carriage business in Detroit so they probably worked for him also. In 1903, Everitt formed his own auto manufacturing firm, the Wayne Automobile Company, but his firm continued to supply bodies to Olds and then to Ford. Indeed, he built his Wayne plant on Piquette so that he could easily supply Ford while also building his own Waynes. William E. Metzger, born in Peru, Illinois in 1878, came to Detroit as a youth and developed a successful business selling bicycles. Cars fascinated him, so he attended the 1895 International Automobile exposition in London. He organized the first United States auto show, held in New York’s Madison Square Garden in 1900. The next year, he established the first auto dealership in this country, in Detroit, of course. He sold small numbers of a variety of gasoline- and electric-powered vehicles made by different manufacturers. His business grew so much that in 1903, he had Albert Kahn design a four-story addition to his sales and service building on East Jefferson. Walter Flanders, born in Vermont in 1871, dropped out of school at an early age, and then moved to booming Cleveland where he took a job as a machinist at Singer Sewing Machine company. Later, he migrated to Detroit where he worked as a machinist at the Waltham Machine Shop. While there, Henry Ford ordered 1,000 crank shanks. At this time, Ford had such little capital that he could not produce parts for his cars so he purchased parts from suppliers and assembled them. Flanders produced the crankshafts so rapidly and competently that Ford hired him. He rose to superintend Ford production in the pre-Model T era. Flanders, however, did not get along with Mr. Ford, so he was fired or quit just one week before Ford announced the Model T. Flanders took credit for developing the production facilities that Ford used when he first made Model T’s on Piquette Street. That is, Flanders claimed much credit for the invention of the automobile production line, one that Ford experimented with in his Piquette Avenue Plant and then perfected about five years later in the For d Highland Park plant. 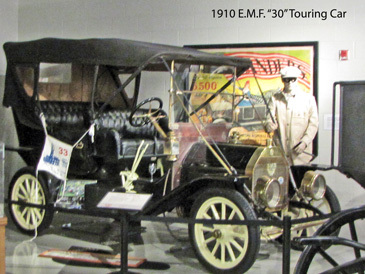 Everitt, Metzger and Flanders got together in the spring of 1908 and decided to produce a moderate-priced car for that large market of consumers that Ford sought to tap with his Model T. The E-M-F company was formed in July, 1908. Their new firm was, in many ways, a merger of seven existing auto firms including Everitt’s Wayne. I am a little unclear about the history of the plant pictured above. I believe that its first components were built by 1904so that Everitt could produce his own Wayne automobiles and bodies for Henry Ford. Shortly thereafter, I think, it was expanded—perhaps to the size you see in the snap shot—for the product of E-M-F vehicles. From 1908 to 1912, E-M-F’s were produced in Detroit. This was not the ideal choice of initials since competitors said they stood for; “Every Mechanics Friend,” or “Every Mechanical Fault” or “Every Monday Fix-it." In 2009, the Italian firm, FIAT, took over Chrysler. We will see if the new management from Turino brings back the FIAT name plate. I purchased two FIATs in the 1970 and knew that many assumed the letters stood for Fix It Again, Tony. Evereitt, Metzger and Flanders began to raise capital for a large firm, and realized that they needed an effective marketing system to compete with Henry Ford. They were successful in securing the funds to build the large factory that you see, one that opened in 1909 or 1910. It was designed to turn out 10,000 cars per year. As for sales, they decided to collaborate with Studebaker, the long standing and well estbalished South Bend wagon maker that had moved very gingerly into the automobile business. Studebaker had an extensive distribution and sales network, albeit one dedicated to the sale of farm wagons. Actually, Studebaker made very few cars in their home plants in South Bend since this family owned firm decided to concentrate on the wagon market. They assembled some cars in South Bend using parts and components from the Garland firm out of Cleveland and Elyria, Ohio. I believe some of these cars had the Garland nameplate and others the Studebaker nameplate. Studebaker's management recognized the growing market for motor vehicles and needed either a place to built cars or a firm that would supply them with cars for their wagon dealers to sell. Studebaker and EMF discussed opportunities that led to collaboration. There was, apparently, great disagreement about whether EMF should remain and independent firm or join with Studebaker. In May, 1909, Metzger and Everett pulled out of their collaboration with Flanders on EMF. Studebaker bought their shares but I think this was followed by much litigation. 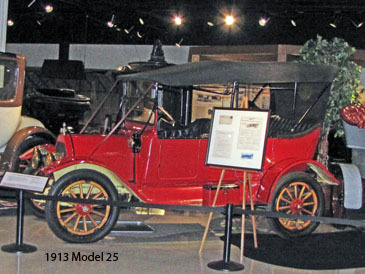 Many companies sought to stand out in the early automobile industry. EMF caught a great break. In the summer of 1909, an organizer promoted an automobile tour from Chicago to Denver across the roadless Great Plains. Remarkably, an EMF car served as the pathfinder and performed flawlessly. Metzger—the publicist of the group—capitalized upon this marvelous accomplishment. The collaboration with Studebaker was promising since that firm claimed to have 4,000 dealers selling its wagons across the county, but did not work out so well. Basically, the founders of EMF apparently believed they would produce a successful new car that would use the Studebaker sales organization, while Studebaker officials probably saw them as a dependent supplier. I infer that Studebaker's management and the EMF management were generally in disagreement. Despite the disagreements, many vehicles were produced in the large red brick factory you see pictured above. Some carried the EMF name plate, some Studebaker and, after 1912, some were called Flanders. In 1909, the Studebaker-EMF firm turned out 8,000 making them the fourth largest producer behind Ford, Buick and Maxwell. Ford, whose plant adjoined the plant you see above, produced 18,000 cars that year. 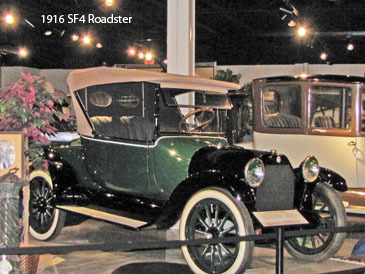 In 1910, Studebaker-EMF assembled 15,000 cars, just about one-half the Ford production of 32,000. 1911 was the year in which the two most productive automobile firms were side-by-side in this Milwaukee Junction of Detroit. Ford produced 70,000—but not all at the Piquette Avenue plant—while Studebaker-EMF assembled about 27,000. Walter Flanders left the firm in 1910 or 1911 as Studebaker took full control. 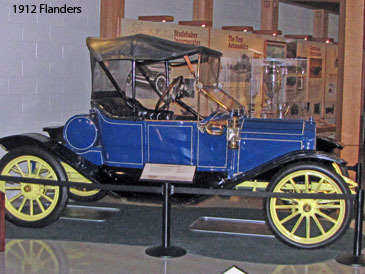 Nevertheless, a Flanders model was introduced in 1912. By 1913, however, Studebaker was only making Studebakers at this plant. As the United States approached World War I, the demand grew for horse-drawn artillery wagons. Studebaker got the military contracts and stopped assembling vehicles in South Bend, so all Studebakers were made at the Detroit p lant you see pictured above. After the war, Studebaker recognized they had a valuable marquee, but decided not to remodel their old carriage factories for the automotive industry. They considered moving the entire firm to Detroit. By this time, they owned the large and productive factory pictured above. However, they had a favorable experience with their personnel in South Bend and the Studebaker family had firmly established themselves in that Indiana city, owning a bank and funding an impressive Episcopalian church. They decided to build a massive array of modern assembly plants that still stand just south of downtown South Bend. I believe that the first South Bend Studebakers rolled off Indiana production lines in late 1919. As those new plants came on line, Studebaker shifted production to Indiana, and by 1926, the Detroit production line was shut. Studebaker continued to own the Piquette Avenue plant. In the early 1930s, auto sales were extremely low because of the Depression. Studebaker decided to invest in designing a high quality, modest priced car. They gave it the name Rockne in honor of the famous Notre Dame football coach. Rocknes were build here on Piquette Avenue in 1932 and 1933 but they did not sell well. I believe the factory was sold to Ford and then to Chrysler. In 2004, elaborate plans were announced to convert this building into attractive and expensive condos. 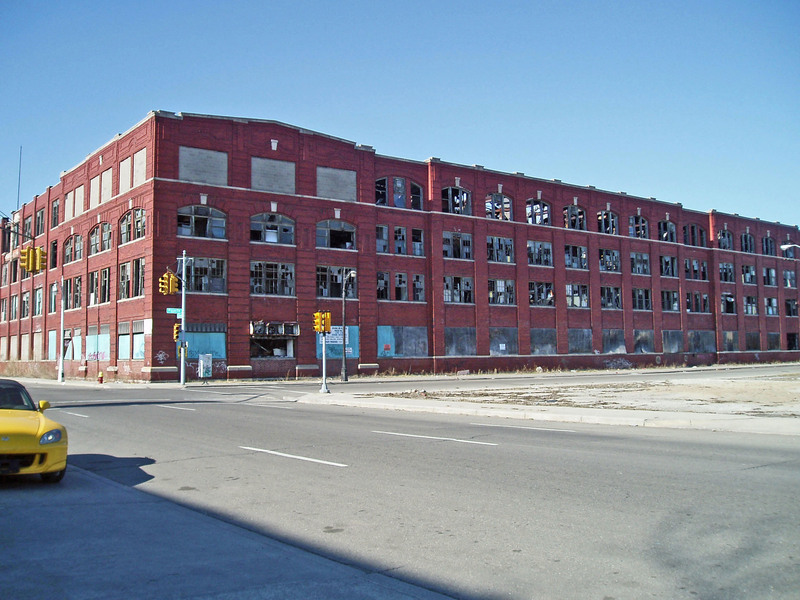 If employment in downtown Detroit and in the corridor linking the city’s Cultural and New Centers booms, this attractive Milwaukee Junction plant might have become an upscale condominium complex. However, it burned to the ground in June, 2005 before any renovation began. By 2010, part of the footprint of the EMF building was used for a large new building offering housing to Michigan's military veterans. Date of Construction: 1910, although some part of the building may date back to 1904. Architectural style: It is a transitional auto plant. The earliest plants were constructed in the mill style such as the adjoining Ford Plant at Piquette and Beaubien. The typical modern Albert Kahn plant is the nearby Fisher Body #21, also just a stone’s throw away on Beaubien. This Studebaker plant resembles the 1905 Cadillac plant that you can see by walking the short distance over to 450 Amsterdam. National Register of Historic Sties: This area is within the Piquette Avenue Industrial Historic District, listed on the National Register in February, 2002.